Topped with Tim Tams and Maltesers, this easy Baileys Chocolate Ripple Cake is guaranteed to become a new favourite! It’s no secret that I love a good Chocolate Ripple Cake recipe, with just a *couple* of them on the blog already – make sure you try my Caramel Chocolate Ripple Cake recipe – yum!! This Baileys Chocolate Ripple Cake is certainly a version just for the adults thanks to the addition of two shots of Irish Cream to the whipped Chocolate Cream mixture, although you do want to make it family friendly (and share with the kids!) then you can easily leave the Baileys out. Like all Chocolate Ripple cake recipes, there really isn’t too much involved putting this recipe together, do try to make it a few hours in advance (preferably at least 4 hours) as this will give the Baileys flavoured chocolate cream a chance to soak right into the chocolate ripple biscuits to create a lovely and soft texture. 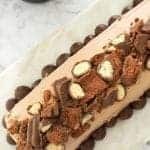 Just when you thought this recipe couldn’t get any better, before popping this Chocolate Ripple Cake into the fridge make sure you generously decorate it with Maltesers and chopped Tim Tam pieces – I promise you won’t regret it!! To store, carefully cover it with some cling wrap or pop into an airtight container and keep refrigerated until needed. This easy no bake Baileys Chocolate Ripple cake is topped with Tim Tams and Maltesers - what more could you want?! Pour the thickened cream into a large bowl and add the icing sugar, cocoa and vanilla extract. Use an electric hand mixer to whisk the cream until soft peaks form. Add the Baileys Irish Cream and lightly whisk to combine. Place a large serving plate onto your bench and place a little of the whipped cream onto the base, as this will help support your filled biscuits. Place a little cream between two chocolate ripple biscuits and stand them on your plate in the cream. Repeat until you have completed your Chocolate Ripple log. Use a spatula to spread a thick layer of cream all over your Chocolate Ripple Cake. Make sure it’s covered well and you can’t see any of the biscuits. Carefully place the Maltesers around the base of your Baileys Chocolate Ripple Cake and decorate the top with chopped pieces of Tim Tam Biscuits and extra Maltesers. Carefully cover your Chocolate Ripple Cake and place in the fridge for 4+ hours to allow the biscuits to soften. You will need to leave this Baileys Chocolate Ripple Cake in the fridge for 4+ hours to allow time for the biscuits to soften. If you can't find Maltesers or Tim Tams, you can use a similar type of chocolate and or/biscuits instead. For more great dessert recipes, check out our collection of no bake Christmas recipes, Cakes and Cheesecake and easy family recipe books and ebooks. You can shop the collection here. Is it possible to get a hard copy of recipe books?